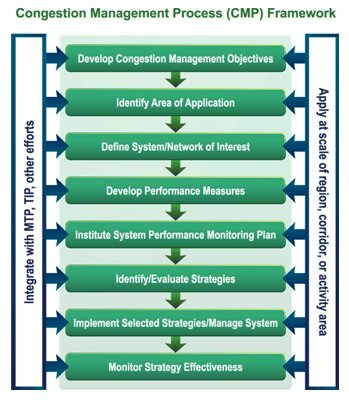 1.0 Developing a CMP: The "8 Steps"
The congestion management process (CMP) uses the objectives-driven, performance-based approach described in this guidebook to focus on managing congestion. The CMP looks at M&O and other strategies for managing congestion, focusing on developing objectives that drive performance-based planning for responding to congestion. The CMP is based upon objectives articulated in the metropolitan transportation plan (MTP). The CMP incorporates specific, measurable, agreed-upon, realistic, and time-bound objectives that reflect regional goals. And, as an integral part of the planning process, the CMP feeds projects and strategies directly into the MTP and transportation improvement program (TIP). Developing a CMP typically follows an eight-step process. Figure 6 illustrates the entire framework for the CMP process. The first step in developing a CMP is to identify objectives that focus on congestion management. These objectives typically are derived from the vision and goals articulated in the MTP. These objectives include SMART criteria, as within the objectives-driven, performance-based approach, and are defined in terms that enable stakeholders to focus on specific aspects of congestion. For example, objectives for commute trips may be different from objectives for other travel purposes. Alternatively, objectives may be established only for peak period travel as opposed to off-peak period. Objectives may also be developed for freight movement, and may be focused on activity areas or corridors where the movement of goods is particularly important, such as a port, terminal, or freight corridor. The CMP should be applied to a specific geographic area and network of surface transportation facilities. Often an area of application may align with the same geographic area as for the regional ITS architecture. This alignment would allow system inventories and network descriptions to link together. The area of application must encompass at least the transportation management area (TMA) boundary, though it may be advantageous to include the entire metropolitan area boundary (TMA boundary plus the area that will become urbanized within the next 20 years). In non-TMAs, the area of application is most likely the MPO planning area boundary. In some areas, where significant facilities or activity centers border the limits of a given metropolitan area, it may be appropriate to expand the CMP boundaries to include a broader analysis area. Whatever the area of application used, the CMP should define the system characteristics and transportation network under consideration. The CMP should be multimodal, so the network should include both highway and transit facilities. Freight and/or rail transportation assets may also be included as conditions warrant. The CMP could consider particular corridors or activity centers, in addition to encompassing an entire metropolitan area. Finally, the CMP may also comprise a combination of regional, corridor, and activity area definitions, with each component serving different, specific purposes. As with the objectives-driven, performance-based approach, performance measures created for the CMP should be derived from the goals and objectives established during the MTP process. Performance measures should reflect the impact of congestion on travelers and on economic activity, such as the number of highway accidents or lost time due to congestion. Measures developed should be flexible in their application and may change over time. Measures should include multimodal consideration. For example, measures related to highway congestion should be accompanied by those for transit, goods movement, and non-motorized modes. Finally, ideal performance measures will allow system performance to be tracked over time. For a CMP to be truly effective, it requires a coordinated program of data collection and system performance monitoring to assess the extent of congestion and to see whether remedial steps are working. Data collection needs are based on the performance measures selected. The data should be relevant to the area, readily available, timely, reliable, consistent, and susceptible to forecasting. Common sources of data include traditional methods such as travel surveys and screen line counts, traffic counts, ITS traffic detection devices, aerial surveys, and speed surveys. As the CMP is performance-based, strategies that manage congestion should be identified and evaluated for their performance. A full range of potential strategies should be considered, including M&O strategies (including travel demand management), land use strategies, and infrastructure improvements. An evaluation would rely upon the performance measures selected and assess whether associated objectives were realized. This step involves the implementing and managing the defined strategies. Managers of the CMP should work closely with the operating agencies that have participated in the CMP. Information developed throughout the process should be applied to establish priorities in the TIP, thereby facilitating the implementation of the CMP. This ensures a linkage between the CMP and funding decisions either through a formal ranking and weighting of strategies and projects, or through other formal or informal approaches. Finally, as with the objectives-driven, performance-based approach, the CMP is an iterative process. Each step is evaluated and opportunities for improvement are noted. Based on the feedback received, an MPO should revise its CMP and restart the process anew. 2.0 Beyond the "8 Steps"
Decide on what you want to accomplish. There should be general agreement on how the goals and objectives expressed in the MTP are articulated in the CMP. Different stakeholders will have different objectives, which should be accommodated in the process. Develop a working team or steering committee. Existing organizational arrangements may be appropriate, or new committees can be formed. Either way, it is important for the groups to have a broad membership that includes planning and operations staffs from the member organizations of the MPO – representatives from local jurisdictions, State DOTs, and public transportation operators. Prepare a timeline for developing the CMP. As with any strategy, it is smart to set specific tasks, schedules, levels of effort, and responsibilities for carrying out the CMP. If the CMP is part of the MTP, strategies can be treated just like the other implementation measures. But, whether or not the CMP is prepared as an element of the MTP, the timeline ought to allow time for the CMP to "feed" projects and strategies to the MTP development process. The timeline also should identify an update schedule as well as data collection and analysis activities in support of periodic assessments of the effectiveness of implemented congestion management strategies. Conduct a self assessment. Assess not only where your MPO stands in developing a CMP, but what you are doing now to address congestion in terms of both long-range planning and short-range efforts to manage congestion. Define a clear role for the State DOT and other operators. While MPOs generally welcome the involvement of the State DOT in the metropolitan planning process, the active participation of the DOT in the CMP is not always clearly defined. The perspective of the DOT as an operator is important in sharing data and developing congestion mitigation strategies. Yet, it is also important that the DOT appreciate the perspective and priorities of other participants. "Acceptable" levels of congestion may differ according to transportation facility, geographic location (metropolitan area or subarea), and/or time of day. For instance, a higher level of congestion may be acceptable in a transit-oriented development (TOD) area where planners hope to encourage the use of public transportation, while system operators may wish to maintain a higher level of service in areas poorly served by transit. In any case, the operators of facilities – including the State DOT – should be sensitive to the priorities of various stakeholders in the CMP. The Final Rule on Statewide and Metropolitan Transportation Planning makes clear that coordination and consultation between the State DOT and MPO is required; State DOTs are "encouraged to rely on information, studies, or analyses provided by the MPOs for portions of the transportation system located in metropolitan planning areas" (§450.208). Furthermore, the statewide planning process "shall (to the maximum extent practicable) be consistent with the development of applicable regional intelligent transportation systems (ITS) architectures..." The Final Rule also encourages "consultation with, or joint efforts among, the State(s), MPO(s), and/or public transportation operators" (§450.212). The States should be partners in the development and application of the CMP, particularly for portions of the transportation network within the MPO that are operated by the State DOT. Collaborate. Collaboration on regional operations, including the development and implementation of the CMP, is essential. Collaboration enables development of projects and policies that have a regional effect on users, including activities such as incident management, advanced traveler information services, public safety and security, management of the impacts of special events, and implementation of electronic payment measures. Moreover, collaboration among operators, service providers, and planners for all surface modes affecting, or affected by, congestion, helps to answer questions about the long-term operation, integration, and evolution of facilities and services. The congestion management process provides a mechanism for identifying short-, medium-, and long-term strategies for addressing congestion on a system-wide, corridor-level, or site-specific basis. Once operations objectives relevant to the area in question have been established, the CMP draws upon appropriate performance measures to identify specific congestion problems. Data from the MPO's resources or from the appropriate operating agency is used to characterize the nature of the congestion problems, and technical tools are applied to help identify appropriate strategies. The CMP uses a cooperative approach to involve both affected operators and the public in a consideration of strategies, both in terms of the effectiveness of proposed solutions and the acceptability to various stakeholders. Together, affected parties and system operators determine the availability of resources and the timing for implementation of proposed strategies. The actions identified through the CMP then become part of the alternatives analysis process, in which proposed solutions to the broad array of regional problems are considered in context. Actions offered through the CMP are then incorporated into the MTP, based on how they compete with projects and programs proposed by other interests during the planning process. The CMP and the regional ITS architecture are both technical tools that assist planners and system operators in developing and selecting strategies for improving the movement of people and goods in a region. The regional ITS architecture focuses on the application of information and communications technology to transportation problems in a technologically coordinated way. A common framework guides practitioners in establishing communications (and, ideally, integration) across technology applications and helps them to choose the most appropriate strategies for processing transportation information. The regional ITS architecture defines the system components, key functions, organizations involved in developing an architecture, and the type of information to be shared between organizations and between parts of the system. While the CMP is not focused on any particular set of strategies, an understanding of the regional ITS architecture is crucial in appreciating the existing and future interconnections, or even the simple ability to communicate, between agencies and systems. The ITS architecture, which is by design a living document that is intended to be updated on a periodic basis, provides an institutional framework as well as a vision for the interconnections among technologies, systems, and subsystems. SAFETEA-LU requires that "for transportation management areas classified as non-attainment for ozone or carbon monoxide pursuant to the Clean Air Act, Federal funds may not be advanced in such area for any highway project that will result in a significant increase in the carrying capacity for single-occupant vehicles (SOV) unless the project is addressed through a congestion management process." While capacity-expanding projects are not prohibited, the CMP requirement means that the MPO must consider alternatives to capacity increases, and that measures would be incorporated into the project to make the most efficient use of the new capacity once it has been constructed. In all TMAs, attainment or nonattainment, the CMP should identify strategies that complement proposed improvements. These may be measures such as ramp meters for new freeway lanes or access management on a parallel arterial. These complementary strategies extend the life of the SOV capacity in which we invest. In ozone and carbon monoxide non-attainment TMAs, MPOs must establish a congestion management process that gives priority to strategies that reduce congestion and improve the movement of people and goods without requiring the construction of new highway capacity. The decision process in dealing with this restriction on SOV capacity-expanding projects must be documented as part of the CMP in these areas. The CMP should enable the MPO to address both recurring congestion (usually caused by "bottlenecks" where capacity is constricted or where merging and weaving patterns cause conflicts) and non-recurring congestion (resulting from incidents, special events, or other phenomena like adverse weather). Either type of congestion may require analysis at the corridor or facility level in order to pinpoint problem locations or to identify and evaluate potential mitigation strategies. The CMP should also be designed to enable assessment of activities that may not apply to a particular location, such as incident response strategies. Incident-related delay accounts for a large and growing proportion of travel delay, particularly in regions where travel demand is already stressing an overburdened system. Some CMP projects and strategies can be implemented by the MPO through inclusion in the TIP. It may be necessary to convince the TIP committee or decisionmaking body on the merits of the CMP projects by ranking projects relative to their benefits. Other CMP projects/strategies may need to be included in State or local programs to accomplish implementation. Those projects that support the goals and objectives of the plan should be implemented; projects should be ranked according to how well they meet the goals and objectives of the plan.